Mudjacking is a repair option for sinking concrete slabs. It makes use of a slurry that consists of sand, water, and a bit of portland cement, which is responsible for making the material hard and solid. The process starts with drilling a 1 ⅝” hole on the sunken slab. Using hydraulic pressure, the slurry is pumped into the void until the slab starts to lift back up to normal levels. This is considered a structural fill because the slurry can be very heavy once it solidifies. The slurry requires a day or two to cure before the patio can be used again. This process of concrete raising is similar to mudjacking but it uses a different type of material. It starts with drilling a hole on the sunken slab, usually a ⅝” hole, which is an inch smaller than that required in mudjacking. A liquid polymer foam is then injected into the void. A chemical reaction then occurs, causing the foam to expand. This stabilizes any loose soil underneath and slowly raises the slab back into its rightful alignment. This is ideal for urgent projects because the material only needs 15 minutes to cure and solidify. This is a popular option because it cures fast, weighs a lot less than concrete, and uses a non-toxic material. Before any repairs, it is important to have an expert concrete contractor assess the sunken area. 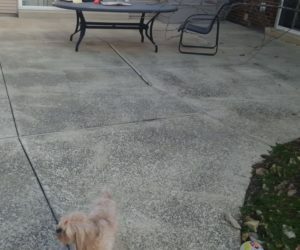 The results of the assessment will help you determine what the cause is, if a repair is still feasible, or if the entire concrete patio is better off replaced. Some repairs are too complicated and expensive that replacement costs pale in comparison.